There’s something about Aldi activity trackers that brings out the curiosity in people. The Crane Wireless Activity Tracker, which has been sold in a few different forms over the years, is one of our most popular single-item posts of all time. Likewise, we’ve seen a lot of interest in the iTECH Fitness Watch, another fitness device from Aldi that does a lot of the same things. When you consider how expensive Fitbits and other more well-known fitness trackers can be, this isn’t much of a surprise. The iTECH Fitness Watch, which retailed at the time of this post at Aldi for $24.99, appears to be a slight rebranding of a product called the iFitness Activity Tracker, which is sold at some big box stores. 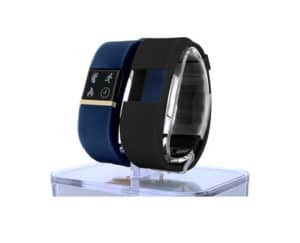 The iFitness tracker uses a different app from the iTECH fitness watch, although the two look to function almost identically, as you can see here (iFitness) and here (iTECH). There are some features we don’t see on the watch. For one, there is no indication with either the iTECH or the iFitness on water resistance, so we have to assume that this isn’t something to go swimming or showering with. Two, it doesn’t say anything about heart rate or the ability to customize step size, so you can probably assume those features are out. In our experience, one of the most important parts of any fitness tracker is its app, since a lot of the functionality is dependent on the app. The Android and iPhone apps are relatively new, so at the time of this post we don’t have a lot of feedback on them. However, we do know more about the iFitness apps made by the same company. A look at those apps (here and here) shows a 3.0 average out of 5.0 on Google Play and a 3.7 out of 5.0 on the Apple App store. Those are not terrific scores, although they are better than the terrible reviews of Aldi’s Crane Wireless Activity Tracker app, so the iTECH may be a better bet than the Crane. As for the watch itself? There isn’t a lot online on that one, although what we could find on the iTECH’s counterpart, the iFitness, is mixed. The biggest complaint is the band staying on. We’re not sure if this problem persists with the iTECH. There are a lot of unknowns at this point with the iTECH Fitness Watch, although for the budget price of $29.99, it may be worth the risk for some people. The apps, at least, appear to be better than the ones for the other fitness tracker Aldi sells. We’d be very interested to hear feedback from users in the comments. so, how do I recharge the crane fitness tracker….or don’t ! With both the Crane and the iTECH, you have to remove the display from the band and charge it, probably with a USB cable. I do not see a place to plug a charger into the Crane….. Your band and the display are two different pieces. You’ll need to remove the display from the band, then plug the display into the USB charger that came with your tracker. Your manual should show you how to do that. There’s no need to remove the watch from it’s band! The charger gets plugged into a USB device and on the back of the watch where you’ll see 3 small metal, gold colored circles. The other end of the charger has 3 prongs. It clamps onto the watch, lining up the prongs with the little circles. With the iTECH watch I just purchased from Aldi, you don’t need to remove it from the band to charge. It has a clip with a 3-prong connection that just clamps to the watch. Line up the connections and release the spring loaded clip. I used to have a Crane and that model you did have to remove it to charge. Just purchased this tracker. Not sure how accurate it is. I don’t have a super sedentary job, however, the tracker says I have walked 6600 steps already today. Seems a little high…..
One thing you might try: if the tracker is on your dominant hand, try putting it on your off-hand. Sometimes things like writing or even eating can fool the tracker into thinking you’re walking. I have a Garmin and it does that, so I’ve got it on my off-hand, which has helped make it more accurate. Yeah the charging is weird. My battery keeps blinking on the display of the watch. Does that mean it still needs to be charged? It doesn’t say how long to charge either. I have the app(maybe wrong one) but it is paired up. I bought it yesterday and wore it and it shows the steps on the watch but didn’t show anything on my app? Didn’t track sleep or any info at all on my app. Am I supposed to do something for that or how does this work? I’ve went into settings and tried to get into everything. The instructions really don’t help and I can’t find anything online about it. Thanks! You have to sync the app with your phone over Bluetooth. Has the prompt come up for you when you opened the app? yes. I first charged the watch – charger cable was included. Then I downloaded the app and just followed instructions. The sync came up. You need to allow it to use Bluetooth. The watch now displays that I have notifications on my phone. I find that you have to leave the display in the band in order for the charging clip to really grip the correct way and charge the battery. I let it charge overnight and it’s held a full charge since so far, and will apparently remain charged for ~5 days. The included manual is pretty bad and doesn’t explain a lot of basics, including charging and that flicking your wrist will turn on the watch. App is decent; said I got 9.4 hours of sleep and broke it into deep, light and wakeful portions with a nice graph to represent the sleep cycles visually. So do you leave the display in the band to charge it? And clip the whole piece on to it and line up the pins to the holes to charge? mine doesn’t seem to be doing anything but it was completely dead when I bought it so I might have to wait a while. What a terrible design. It seems to keep slipping out of the holes. But for $25 I thought I’d give it a try since I’ve never owned a fitness tracker before. We’ll see. Rough start. Yep, leave it inside the band. I had the same issue as you did before, thinking I had to remove the unit from the band, and then only 2/3 of the prongs were making a good connection. It’s a really weird design and I wish they just used a microUSB connection instead. Mine did not record my sleep. Do I need to do something to the watch or app before bedtime? I was able to see my sleep tracking by going into the IOS app, swiping from the Activity page to the Sleep page and then touching the big circle. After that it did a sync with the wrist unit. It seems to be a manual process, but it updated. Mine is doing the same. I can’t get the clip to stay tight enough to charge it, even in the band. Am I able to use this watch just for time purposes and to track my steps? Do I still need to use apps or can I just charge it and use it for time and tracking steps? It works just fine for that purpose. All you need to do is push the button on the side of the unit. Thank you! That was the missing piece of information to make the wrist unit function as I wanted to use it! I just got this and walking around with it but still indicates zero steps and doesn’t seem to be tracking any other activity on the watch. Is there an initial step I’m missing?? Can you see texts from your phone on your display? My gym’s kids klub texts me if they need me to get my kids. But I don’t like always having my phone while I work out. With apologies if this has already been asked, but will this device work (to track steps, monitor sleep) without a phone? Thank you! Since I’ve synced the iTech with my Android phone, my phone sometimes alarms randomly (probably when the fitness tracker becomes unsynced). Anyone else have this issue? How do I stop the random alarming? Mine keeps ringing and saying that the Band is not connected, but doesn’t say connected to what. When I check my phone setting for it, it states that Band is connected. I am confused now. That could be the alarm that tells you you have been sedentary too long. You can set that up in settings. Mine only seems to count steps when I’m outside and have phone nearby. Is that how it’s supposed to operate? Thanks in advance. I’m having trouble getting mine to charge. I left it plugged in all day yesterday. I have kept it in the band, as another reviewer said before, the clip grips it better in the band, but mine does not seem to really charge even when clipped. It’s day two of trying to charge it and it still won’t turn on. Does anybody have any tips or tricks on how you get yours to charge? birdson Yep….tried that. At various intervals as well. Yes, I’ve done that. At various time intervals actually. Mine has stopped charging as well. I iked it besides that now not charging. take a medium binder chip and and take it out of the band and clip the charger and watch together, that’s how I got my to charge. Can somebody please post a video on how to charge this?! Is there a way to change the time? For some reason after I charged mine the 1st time it’s now 15 min too fast?!? It should sink with your phone time once you’ve installed the app. I just bought one yesterday and I am pretty impressed with it so far. My only complaint is like everyone above has said the charging is a little challenging. Mine has stopped charging. I have tried several way trying to make it work but it is still not charging. Help. The best way I have found to charge it is to not let it die. If it completely loses charge it takes forever for me to get it to charge. However, if you charge it when its still on it will charge better, you just have to babysit it the whole time. I usually have to go and press the clip in about every 30 mins to make sure its connecting and it will eventually charge. To ensure that the three prongs stay in the contacts I use another clip – big clip usually used for keeping chip bags closed. Once everything is secure and all prongs actually make contact I have no problems with charging. This is a clumsy work around, but it works. No issues with the tracker, very satisfied with the performance for the price. Have you been able to get text alerts? I just got my watch today and that feature does not seem to be working for me. I just received this tracker three days ago and wanted to share some things I have discovered. I want to start off by saying the device has been working as it should. Now lets talk about a couple issues I have with this smart band. Lets start from the beginning! The manual is very close to useless. The one thing it does help with is were to download the app. When download the app make sure it is the iTECH activity tracker and not the iFITNESS app, they look allot alike. On to the second issue. Make sure that the device is paired to your phones bluetooth. The app will sync with the watch without being paired with the phone. This will result in some functions working and some not. So if you go to your phones bluetooth settings and don’t see TW64 paired your app will not display track and display everything. In my case the sleep function did not work. Bottom line I like it and would rate it 4 out 5 stars. Have to take a star for crappy manual. The app seems to work pretty well smooth and all features work. Sorry forgot my phone is a LG android phone. When I go to my Bluetooth, tw64 doesn’t show up. I have an iPhone. I can’t figure out what I’m doing wrong. Sorry forgot to mention my phone is an android phone from LG. Mine worked fine for about 3 weeks. Now it is vibrating twice about every 20 seconds. I have all the things that would cause it to vibrate disabled and I only connect it to my phone for a few minutes a day to check sleep. I took the back off to see if I could disconnect the battery to “reboot” it. The battery is soldered in. I am going to let the battery die and see what happens on a recharge. Hi Joe, did you go into your app and try a factory reset? It’s in the settings menu. I did not. Must have missed that one. However I did let the battery die and recharged it. Will see today if that “reboot” fixed anything. Thanks! Hope that gets for you. The reset to me is the last ditch effort because you will lose your data, but if all else fails you have to give it a shot. I just bought the tracker and it is not recording my steps. Did I miss a steep in the set up? Is there a reset option? Hi Reeta, go into your phones blutooth menu and make sure your phone is paired with tw64. Sync your watch to the app and go to the setup menu. There is a factory reset in a sub menu there. I know it’s in one of the options lower on the list. Hope this will help you out. Mine doesn’t seem to track my steps when I wear it on my wrist. I take it out of the band and keep it in my pocket which does work. My steps show 22, first time using the tracker. Just bought it today and fully charged it, set up the app and synced to my phone. Any suggestions to get the steps to record? Just got it and it doesn’t seem to be tracking anything..
Has anyone had a problem with the itech watch causing phone to crash? I got it yesterday and my phone has been weird ever since. I’ve had to reset like 500 times. I bought the iTech fitness tracker was really looking forward to using it. Tracking my steps it would not track my steps. I charged it before even using. Was doing a video dance game, the tracker that I had before I would do on an average of over 4,000 steps. When I went to check my steps after 3 songs it said I had only done 50 steps. Figured that it might be slow. But this morning woke up and walked down the stairs and it said I walked 0 steps. Husband looked at it and got it to work, but he had to hit it on his hand. I tried it and had to hit my leg for it to register a step as I was walking. Am going to return it to the company since they said not to return to store. Disappointed! Sorry to hear that many folks are having issues. I must have gotten lucky so far. The thing that stinks is from what I have read bought these bands is they all seem to lack accuracy. I think my nxt one will be a smart watch. My son in-law and daughter both had Fit Bits his had double failers, first the band and second the unit within a year and a half. He wore his everyday my daughter did not, but she sold hers for a 25 dollar loss. I think I will skip using a heart rate monitor on my next one even if it is equiped this feature seems to be the least reliable on all the bands. My thought is it’s one thing for a device to be off on steps and distance but to be off when linking it to a life giving organ and having inaccurate monitoring can be dangerous. At any rate I have collected three wks of data from the band into the app. I have a low of just over 8000 steps a high of just over 27000 steps and an average of around 16000 steps. This equals around 8 miles. I am getting about 6 hrs sleep 4 deep 2 light and 2 awake counts. I have noticed the step counter likes full strides and will miss some slower shorter strides around the house. Is there a way to trigger the app to sync with the watch on demand? I can’t for the life of me figure out what initiates the sync. It syncs only occasionally throughout the day and I am frustrated by not being able to get an up-to-date reading on my steps. Otherwise, it works just fine and I am pleased with it for the money. But can anybody tell me what to do to get it to sync as desired? To get up-to-date reading on your step you can always press the small button on the right lower end of the tracker. Just slide your finger down the right side, you will feel the button. It is not clearly visible. When I open the app on my iPhone, it automatically does a sync. Ah. Thanks for the info on the button. I didn’t even realize it was there. That is helpful. But are you also saying your phone updates every time? Maybe it’s the difference between iPhone and Android because my Android just barely wants to update til it’s good and ready. You can force a sync on the iPhone by tapping on the circle in the middle of the activity screen that shows the steps if the steps displayed are not the same as displayed on the tracker. For some reason this functionality seems only to work later – after 8:00 AM – in the morning on the sleep display. Can’t find an 800# to call for a return. Mine hold a charge only 24hrs. When I go to my Bluetooth, tw64 doesn’t show up. I have an iPhone. I can’t figure out what I’m doing wrong. Any ideas? My daughter has had the phone for a little more than a week. We were able to figure out the charging, app/settings/bluetooth etc. Everything seemed to be working the way it should but now we’re having the same problem as Joe above. Vibrating every 20 seconds or so. We’ve tried charging, checking all of the settings in the app and even reinstalling the app. lastly we reset to factory settings and it still keeps vibrating! Please let us know if anyone has a solution! My problem seems to be with the time and battery. The time will randomly speed up most the time and show the incorrect time. I have to continually sync it in order to fix the problem which gets annoying. Also the battery doesn’t seem to last more than a day. Can’t track my sleep at night because I have to charge it each night to use it the following day. Not much of a point for the sleep tracker if that’s always the case. (For me). I can’t seem to sync it with my bluetooth. Any idea of where to buy a charging cable? Lost mine on vacation. Can you buy additional bands???? Is it possible to change the time format feom 12 to 2r hours? The other day i charged it and it changed by itself and now its back to 12 hour.